Highsmith’s interaction with this woman went no further but she turned the small clues she had about this woman’s life into an act of wish-fulfilment. The woman she names Carol seeks out the young shop assistant and thanks her. There is a mutual attraction both women act upon, yet the restraints put upon them by society force them apart. Her facsimile whom she names Therese begins to find success as a photographer and make something of herself. While most novels of the era were forced by law to show homosexuals as being tormented by their feelings Highsmith ended The Price of Salt on a hopeful note. Returning to the 50s era setting he used so well for his Douglas Sirk inspired melodrama Far From Heaven (2002) Haynes again deals with the theme of women forced to conform and suffering emotionally because of it. Carol (Cate Blanchett) is going through a break up with her perfectly decent husband Harge (Kyle Chandler) because of her close relationship with her ex-lover Abby (Sarah Paulson). Harge is a nice guy in the aw shucks mould, but he’s becoming increasingly tormented by his inability to save their marriage and is threatening to restrict access to their child. Meanwhile Therese is still finding her way at an age where she’s still trying to work out what she wants. There a controlling would-be fiance Richard (Jake Lacy) and other interested parties including Donnie (John Magaro) a likeable wannabe novelist who takes notes when watching old movies to learn how to write. Highsmith’s work often deals with a dangerous outsider inveigling their way into the life of somebody who is higher placed up the social ladder. While Therese is slightly off-kilter, “what a strange girl you are, flung out from space,” says Carol at one point, it is their romantic involvement which threatens them rather than any sociopathic behaviour. There are hints at Highsmith’s gifts as a thriller writer though which Haynes manages to draw tension from. A stranger they meet on a road trip seems harmless at first but like Highsmith’s most famous creation Tom Ripley he proves to be deceptive. After Carol calls off the relationship it is not immediately apparent how Therese will respond and the casting of the enigmatic Rooney Mara helps in this respect. 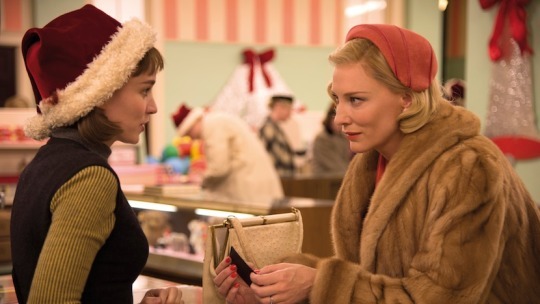 While Far From Heaven imitated a particular style of filmmaking from the 50s’ Carol is located firmly in the period itself. This is a more realistic presentation of the era with a muted if not quite drab colour scheme. Emotions are mostly kept in check as you would expect from a film set during a period when homosexuality was illegal, but occasionally they burst forth. Abby quietly weeping while driving, Carol pulling a gun on a private detective, and finally rising to a crescendo during its transcendent last scene recreating perfectly Highsmith’s original defiant ending.